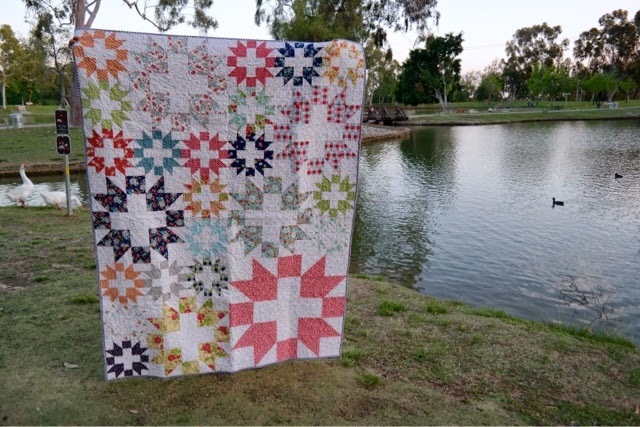 This quilt was one of my finishes for the first quarter of 2015. I included a finished photo in my blog post about my first quarter finishes but I think it deserves a blog post of it's own. There has been a lot of sewing going on at Casa Stanley, but I have not taken the time to photograph the finishes let alone blog about them. Instagram is just too convenient, isn't it? This lovely pattern is by Claudia, whom I met at the very first Sewing Summit. I couldn't believe she came all the way from Germany for the retreat. Now I know that people (including me) travel all over to meet their quilty friends. You can find the pattern on Craftsy. This quilt is a birthday gift for my friend's 60th birthday later this month. Made with Happy Go Lucky fabrics by Bonnie and Camille, one orange print that coordinated with the line for the largest block and Kona Snow for the background; this quilt came together easily. The pattern was simple to follow. I tweaked the instructions just a bit and used the make 8 HST at once method. Here is the link if you would like to try this method. We went to the park the other day to take photographs, but arrived just as the sun was going down, so some photos are a little dark. I quilted the quilt on my Bernina 820 using loops and swirls in an all-over pattern. I think it's fun to quilt words into the design so I included a "Happy Birthday, Doreen" in the quilt. 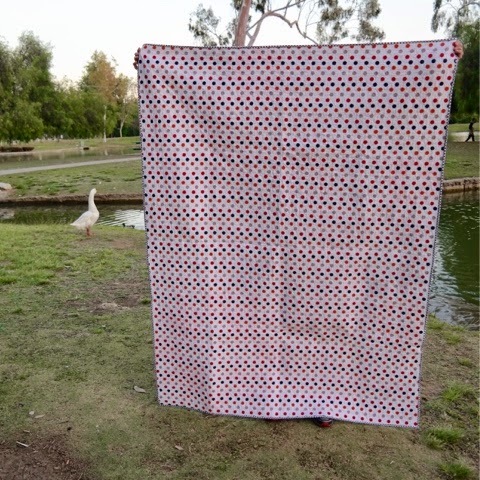 I snapped a few photos in the garden to try and show the quilting and the true colors of the fabric. For the backing I used Riley Blake Medium Dots in Boy. The dots are navy, grey and orange and go well with the Happy Go Lucky colors. For the binding I used a navy and white print from the Happy Go Lucky fabrics. I have two more projects I need to blog about. Both are for Sewtopia. I am frantically trying to get ready for the trip to Chicago this coming weekend. Fabric used: Happy Go Lucky by Bonnie and Camille, Kona Snow, one orange print from stash. Measurements after Laundering: 56" wide x 75" long. This turned out really sweet! Perfect fabrics for this pattern imho. Gosh what a fun and happy quilt! I have a stack of Happy Go lucky I came across...shh.....of course I knew I had it! And I think something with various size blocks is perfect, just need to settle on something. I sure like your finish!! 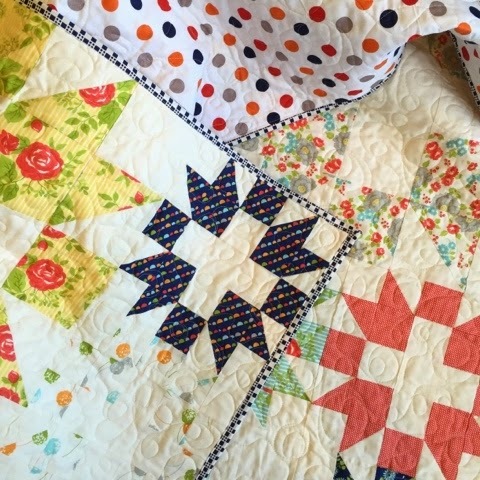 Another lovely quilt in your portfolio Di! I love seeing the places you come up with to take your photos too! The lighting seems perfect! The Australian sunlight can be a challenge at times- too harsh and stark! That's a super happy 60th present! Your friend is very lucky! Love this one, Di! What an amazing birthday gift. Wowza! What a stunning finish! Loving this one. Great finish Di! Love seeing this pattern made up in this line - indeed a Happy quilt! Have fun at Sewtopia!